Police say they intercepted a twisted murder-for-hire plot, and now a New Hampshire woman is behind bars. Claremont Police say Monique Earle is the mastermind behind a plot to get her ex-boyfriend's new girlfriend out of the way. "This is only the second time in my career that I've seen an investigation of this nature," said Claremont Police Chief Alex Scott. Scott says an informant called police Tuesday night with a startling piece of evidence. "A hand-written document allegedly from Ms. Earle outlining what she wanted to happen to this individual," Scott explained. "The plans were for [the victim] to be kidnapped, drugged, and raped for a few days," court documents read. 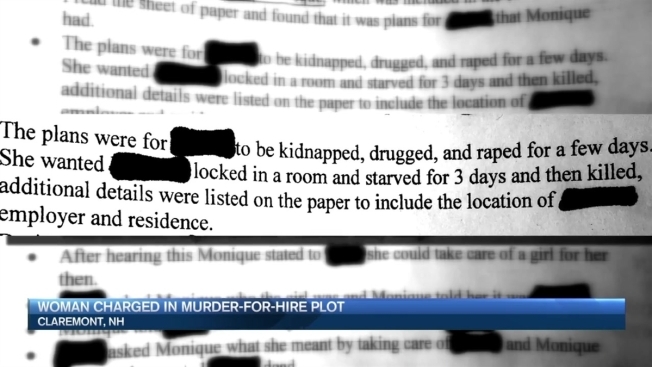 "She wanted [the victim] locked in a room and starved for three days and then killed." With that information, the investigation moved quickly. "We devoted full resources to it," Scott said. By Wednesday, Earle believed she was meeting with a hit man, who was actually an undercover officer. Police say Earle offered to pay $500 for the services and even made a down payment before the meeting was over. "It was clear that she wanted this officer to end this young lady's life," Scott said. Police arrested Earle Wednesday night. She's now inside the Sullivan County Jail on $100,000 bail, and the victim is safe. "We were able to put the case together in less than 24 hours and put an end to what could have been a very dangerous situation," Scott said. Earle is charged with conspiracy to commit murder and is due in court Dec. 8.